37 Hours is the second book in the Nadia Laksheva series. I haven’t read the first book, 66 metres, and whilst I didn’t have any problem reading this book, nor following the story, I did miss not having the background information on the characters. The plot opens with Nadia’s assassin father being driven by enemy forces to be interrogated, or killed. He needed to come up with a plan fast, and one that would work to his advantage. His plan was successful, and the enemy now presumed him dead. He watched from afar his own funeral, and spoke of how he knew his girls Nadia and Katya would be fine without him. We then meet Nadia many years later in prison, herself now an assassin, being held by MI6. In the two years that she had been there she had never had a visitor, nor seen a lawyer, that was until her sister turned up with a diplomat, needing her help in exchange for her freedom. A Russian submarine had been taken by force and they needed someone small enough, and capable, to enter the sub via a torpedo tube and take back control. The mission didn’t quite go according to plan, especially when it turned out a nuclear warhead was missing. Nadia suspected that the man, a ghost, she had been looking for before her incarceration was the culprit – Salamander. Problems arose when it became apparent that as much as Nadia wanted to find Salamander, he wanted her dead. He may of been a man that had never been seen, a ghost, but Nadia had her own ghost looking out for her, her father. 37 Hours is an exciting, and completely gripping British spy thriller, that packs a punch. I was hooked from the first page, and raced through it. J.F. 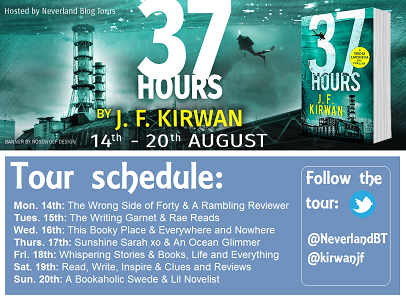 Kirwan has written an explosive plot filled with attention grabbing scenes. The underwater attacks, both from humans and sharks had me on the edge of my seat. The book is completely up to date too, with mentions of Russian PM, Putin, G20, Isis, Chernobyl, and even Twitter. This made the book very real, and if you think about it very scary. Not in a horror kind of scary, but the kind that reminds you just how warped some individuals are, and how intent they are on causing destruction. The book is intensely action packed. It’s filled with twists and turns, and red-herrings, and had my heart racing for most of it. There are also some kick arse characters, Nadia and Lorne, two females, at the forefront, proving that spy thrillers work just as well with women leading the way. An amazing book, that if you love thrillers then you really need to give it a go. Even if you’re not a big fan of them, step out of your comfort zone and give this book a read. It is truly spectacular. You are very welcome. An amazing book to read.